Hellboy must save the world from the mysterious creatures of beyond. Click here to play! Join him as he sets out to destroy the monsters that threaten our cities. You’ll want to stick close to Hellboy in this online slot adventure, as he’s the only thing protecting you from the unknown creatures that lurk below the surface of the streets. His symbol will payout up to a respectable 5000 times your line bet if you can spin three or more across an active payline. Professor Trevor Buttenholm, Liz Sherman, and Johann Kraus are here to give you guidance as well. Each of their symbols will payout a handsome price if you can line up three or more across a payline. Though, you’ll want to pay close attention to the Hellboy logo because it’s a wild and will get you the game’s top payout of up to 10000 times your line bet while you scour the underworld for monsters. As always, Hellboy’s stone hand is the key to unlocking priceless secrets. Spin this scatter symbol three or more times across the board and you’ll trigger a multilevel Underworld bonus that will see you navigating Hellboy through the sewers, saving his friends, and picking up bonus cash. 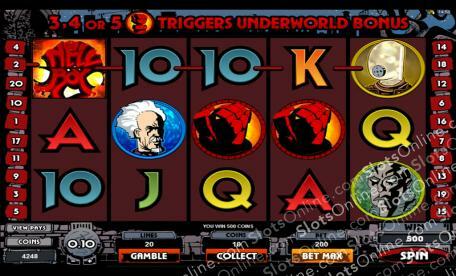 There is also a supermode available in this game that’s triggered randomly and will award 10 free spins. Help Hellboy in his quest to conquer the evil that roams the street and you could pick up a hefty amount. Hellboy's stone hand is a scatter. It will mulitply your total bet up to 500 times if you can spin two or more anywhere on the board. It will also trigger a bonus feature. The Hellboy logo is a wild symbol and will replace all others, excluding scatters, to help you spin in more wins. The Underground Bonus is triggered by three or more stone hands anywhere on the board. This is a multi level pick-a-box style game that will have you navigating Hellboy through the sewers to save his friends and collect bonus prizes. At the end, you will enter the Chamber of Fire for a shot at bigger bonus prizes.